Vegan Mac and Cheese. Is this the greatest comfort food of all time? 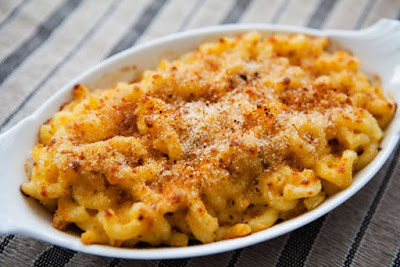 Nothing speaks to me like mac and cheese and for many it's our go to comfort food. However, if you're allergic to dairy, lactose intolerant, or vegan by choice, what's one to do? Thankfully we have our friends at VegNews Magazine to come to our rescue. This is their number one mac and cheese recipe of all time. Make it once and you'll know why. I have reprinted this recipe in it's original form, because I honestly can't think of changing anything. Any changes to this recipe would only diminish it. Thank you to chef Allison Rivers Sampson for her wonderful interpretation of this classic. In a large pot, bring the water and salt to a boil. Add macaroni and cook until just al dente. In a colander, drain pasta and rinse with cold water. Set aside. In a blender, process cashews, salt, garlic, 1/3 cup margarine, mustard, lemon juice, black pepper, and cayenne. Add softened vegetables and cooking water to the blender and process until perfectly smooth. In a large bowl, toss cooked pasta and blended cheese sauce until completely coated. Spread mixture into a 9 x 12 casserole dish, sprinkle with prepared breadcrumbs, and dust with paprika. Bake for 30 minutes or until the cheese sauce is bubbling and the top has turned golden brown.